Contract law is the foundation of our daily life. It is relevant to every business owner, shareholder, joint-venture partner, employer or employee, buyer or seller, landlord or tenant – and consumer. A contract is an agreement between two or more parties. It can be written, oral or by conduct. If the contract is in writing, once you sign your name on the dotted line, your job, reputation, business or even your life may be on the line. the words used are ambiguous or clear with definite meanings. the contractual intention was clear and certain so that the entire contract is complete with no other terms or other additional documents. the exemption, exclusion or limitation clauses are legally enforceable. all parties have considered the “what if” situations and addressed all issues. there is an automatic renewal clause is applicable, and if so, whether the time is essential. there is a fair assumption of risk usually by the party in the position to prevent loss and a fair allocation of the risks between the parties. It is fair for you to hold the other party to the contract harmless and indemnified against any loss, and if so, for what risks and during which period. there are any events that allow you to terminate the contract lawfully, including an automatic cooling off period. the rights and responsibilities of both parties are certain. there were any warranties or representations made by one party to induce the other party to enter into the contract. the parties have tried to save costs by providing for other alternative resolution of disputes, like mediation or arbitration. Damages which are an award of money to compensate the innocent party. Repudiation of the contract which is to bring to an end the contract. Specific performance of the contract which is an order by the Court to hold the guilty party to his contractual obligations. An injunction, which is an order of Court requiring one party to do or not to do something. If you are unsure of the important details of a contract, or you have signed one and are unsure about your rights and remedies, feel free to consult us to have a peace of mind. Don’t make a deal with any loose ends. 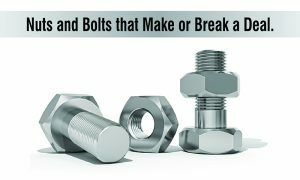 Tighten it with nuts and bolts so that the deal-breaker does not escape scot-free.